Dr. Beth Guertal, an alumni professor in the Auburn University College of Agriculture's Agronomy and Soils Department, shared with Auburn Rotarians some helpful tips for taking care of your lawn, including the best grasses for our region and the best times of the year to fertilize. Pictured with Dr. Guertal is Club President Jim McLaughlin. 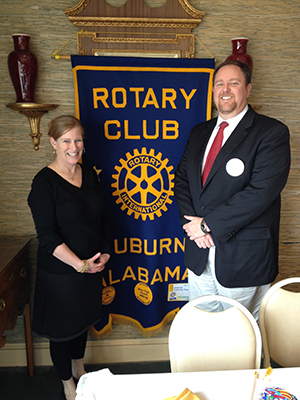 To learn more about the Auburn Rotary Club, visit www.auburnrotaryclub.com.